Ladies & Gentlemen, gather 'round to witness an occult oddity of ultraviolence known only as "THE FREAKSHOW." Who...or what...is The Freakshow? A rare specimen of in-human nature, able to endure horrific levels of bone-crunching, brain-melting, flesh-slashing torture never before seen in our species. Is he a man or is he...a monster? Do normal men possess enough strength to snap a white-tail's neck with their bare hands? Not hardly. Legend has it that this brutal brute was brought up in a strict, religious family where he was taught the meaning of the "Bible Belt" daily. As he grew up, in-school bullying and the maddeningly sweltering heat of the Deep South were the only guarantees in his life, as money was scarce, as were other basic resources. To survive, he was taught how to hunt & butcher feral hogs, bucks, black bear, & eastern wild turkey. When no land creatures were around, he would be forced to wrestle gargantuan alligators to the death just so his family could eat. He found enjoyment in the make-shift slaughterhouse he had co-created with his Father, the only place where he was said to be able to find an outlet for his dark cravings for vengeance & mayhem. Some say it is at the cutting board where he developed a taste for human blood yet, to this date, no one has been able to find enough evidence to convict him of any crimes. However, one afternoon, after several reports of missing people, the local townsfolk discovered human remains near his humble-yet-shabby shack. The one they had picked on in class and called "The Freakshow," stood out like a sore thumb and so he was quickly accused, his dwelling was burnt to the ground, & a mob of men, seething with hatred & visions of revenge, violently attacked & captured him. Right before he was to be hanged, a well-dressed stranger in a top hat & monocle stepped forth from the crowd to make the citizen vigilantes an offer they could not refuse. To a town that was unable to afford even one police officer, the miraculous proposal was a dream come true. They accepted the dirty money from the devilish carny, who promised to punish this "guilty" rarity of nature for the rest of his life for crimes he may, or may not have, committed. Sold off to the "Cirque De La Mort," his abilities were exploited for profit. Billed as The Freakshow, he was brought, via locked animal cages with vertical, rusty iron bars, to many carnival-esque Professional Wrestling competitions around the country where he would fight in a variety of indescribably terrifying bouts called Death Matches, brawling with the top competition of each region until only one man...or monster...was left standing. This tour of torment saw The Freakshow squaring off against equally dangerous adversaries...wrestlers, brawlers, & beasts...from all over the World & in all kinds of deadly circumstances. During these displays, full of dangerous dangles, demonic devices, & dagger-like tips of objects from thumb tacks to mercury-coated, glass shards, or more simply-but-equally-as-vicious barrages of bare-fisted knuckle sandwiches, The Freakshow was known to take a beating & keep on competing...all the while himself withstanding the damage long enough to, in receipt, deliver an offense that has been known to be physically destructive to both male & female grapplers. 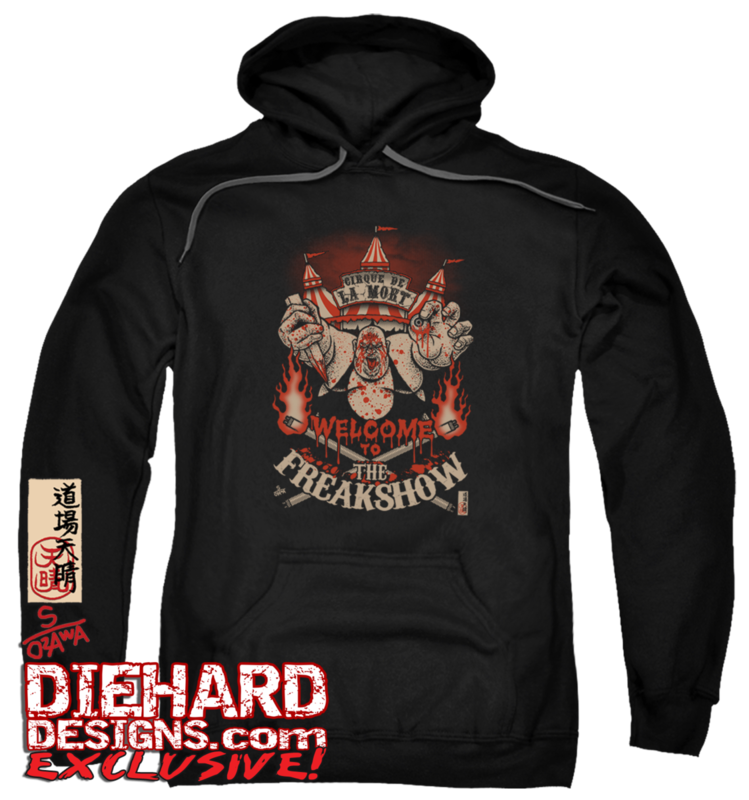 With jaw-shattering punches & elbows, skull-fracturing headbutts, painful powerbombs, and at the worst of times for recipients, the surgical use of a deadly wooden spike to gouge out eyeballs, The Freakshow is a very frightening force to be reckoned with. However, his oppressive overseers underestimated him as a captive. The legend concludes with conflicting stories of how he managed to escape the clutches of his carnival captors & scuffle off into the nightshade. Reports of missing neighbors & coinciding sightings of The Freakshow pop up on online forums & in the last remaining local newspapers from time to time, placing him at state/county fairs, 3-ring bazaars, amusement parks, & creepy sideshows, but most are disregarded by skeptics as hearsay, folklore, & products of over-active imaginations...or just wild conspiracy theories made up to sell T-Shirts. 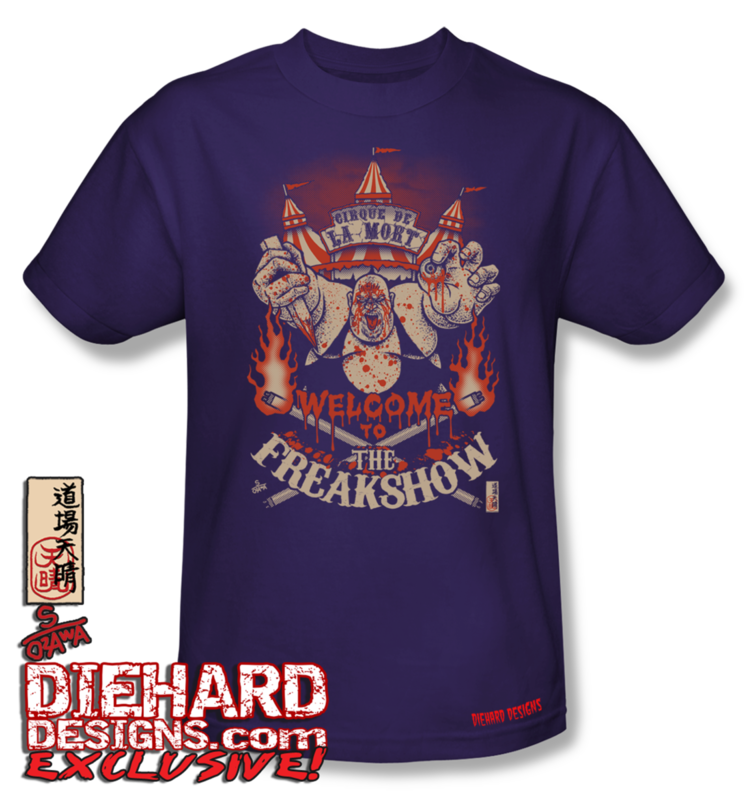 Others claim that the tales of The Freakshow are true and that he is indeed a lunatic on the loose, armed & dangerous, still lurking around in the dark shadows of the Big Top to this very day. 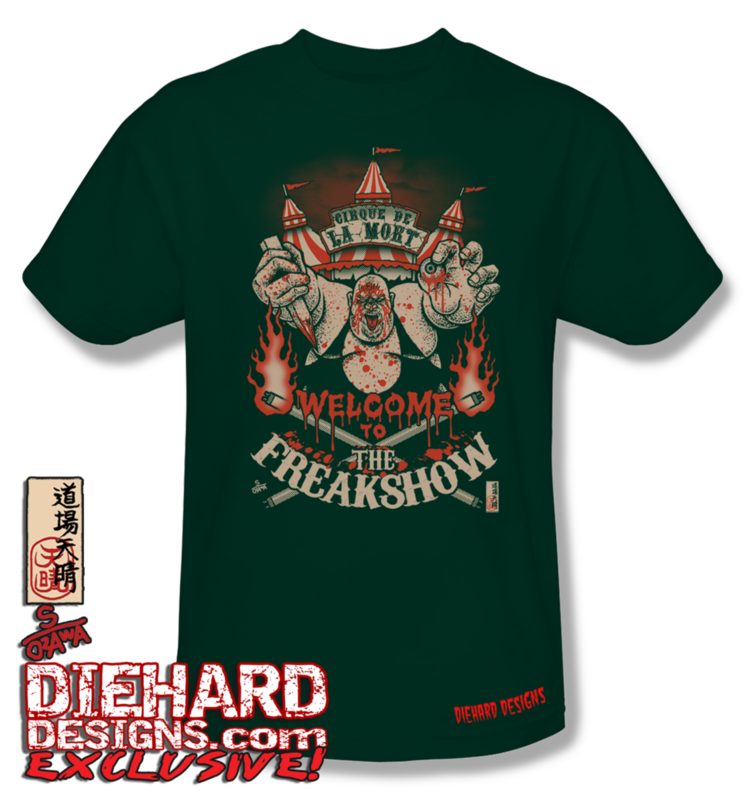 Whether you believe it or not, it is best to heed this warning: watch your back, lock your doors, shut your blinds, turn on your porch light...because The Freakshow could be coming to play in a town near you, or you, or maybe...YOU! Spread the legend of The Freakshow with our EXCLUSIVE "CIRQUE DE LA MORT" design, a collaboration between the talented Japanese cartoonist, Sei Ozawa, and our Co-Owner/Art Director, Diehard Dustin Lee. 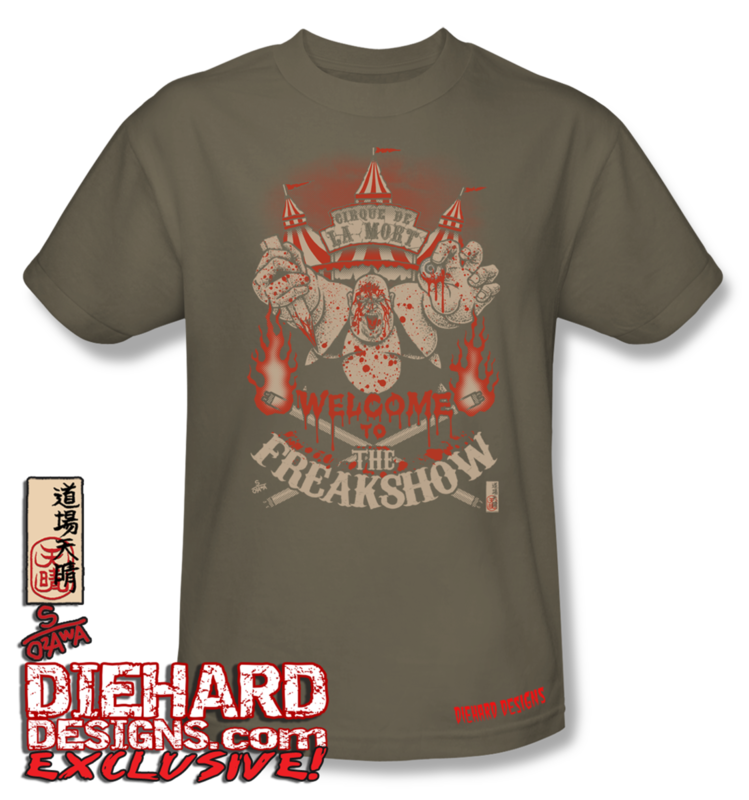 A portion of the subtotal of each piece go to The Freakshow. 100% Cotton High Quality Pre-Shrunk Machine Washable T-Shirt or 90/10 Blend Adult Hooded Fleece Pullover with Full Color Print. Designed in Japan. Conceptualized & Printed in the USA.